Like most couples starting out, The Man and I have slowly accumulated our furniture. We have gotten great deals on most items (thank you Savers and Ikea) and have had our whole bedroom set given to us (thank you Rachel). When I got married I had little knowledge of his eye for design and desire to furnish our home so it would be pleasing to his eyes, luckily we have managed to agree on most items. The past month he had his eyes on some Emeco Navy Chairs. If you are design savvy, or into Mid-Century Modern furniture, you might know what they are or have seen some at Williams Sonoma or Design Within Reach. Anyway, we really liked them and wanted to get some. We considered the knock-offs (obviously because $395 per chair was no where in the budget) but after weighing the pros and cons we found some used ones on Craigslist (yay Craigslist!) ... in Yorba Linda, CA. He drove the Volvo out to the ladies house on a Friday night and there was no one home. She also would not pick up her phone. So, while he is feeling a little crappy about his decision (to drive 6 hours for some measly chairs) 20 minutes goes buy and a guy eventually pulls up to the house. 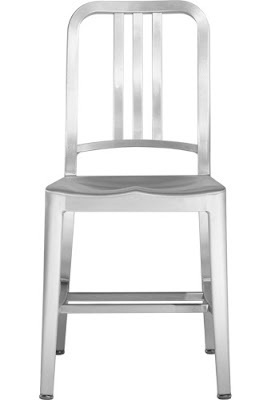 E buys 12, yes 12, of these chairs. Little did I know that he had already posted 6 of them on Craigslist (for more than what we paid) in Phoenix and already had another buyer. He stayed the night in a hotel and drove home the next morning with a car stuffed full of chairs. So, we got our chairs and broke even on the deal. Now, we are dining in fashion. WOW!! That is awesome, have him find me a twin bed in NEvada I can't ever find good deals. *sigh* i heart craigslist. great to hear you found a deal. you certainly did go the distance to get it though. 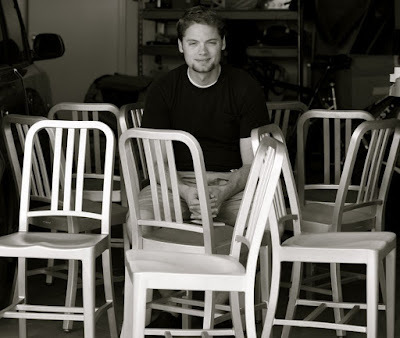 im shocked eric could cram 12 chairs in your car. They're awesome chairs! Way to bargain shop. Although I am totally surprised that Eric would drive all the way to California ... there is the other part of me that just thinks "only Eric!" Hey, at least you are now dining in fashion. ok - i dont really comment on blogs - but this one merits one! A 6 hour journey for chairs is crazy. I love it. It reminds me of when Bec bought a stroller in Baltimore and we drove down to get it. I think she bought like 3 strollers within a short time. She bought one, found a better one, and sold the first for more money than we bought it. And so on. It is way better thn ebay! Oh - you should totally compile all your really cool nature photos and make a southwest calendar to sell. Your photos are really cool/nice/prof looking. I am sure you could get a following (Just don't let Bec but any - we are poor and only buy calendars in Feb when they are 90% off. Since nothing happens in Jan, it all works out.